Along with the fun and sun, the summer months also bring with them loud noises, such as fireworks and thunderstorms. And while many of us love to see the sky light up in a technicolour wonderland or as a result of Mother Nature, for our pets storms and pyrotechnics can cause a great deal of stress and anxiety. During summer it isn’t uncommon for us to see a number of storms or colourful pyrotechnic displays light up the night sky, potentially causing your pet considerable distress. If you know your pet is afraid of fireworks or storms here are some things you can do now to make these events less frightening for them in the future. What can I do with my dog before firework and storm season starts? Planning ahead is the most important thing you can do to help your dog cope with fireworks and storms. Look to provide your dog with their own safe haven. This should be a quiet area, where your animal feels like they are in control, such as a room in a quiet part of the house. Make sure this is an area your dog can always access – even when you are not at home. Train your dog to associate the room with positive experiences. You can do this by leaving a variety of their favourite toys there. 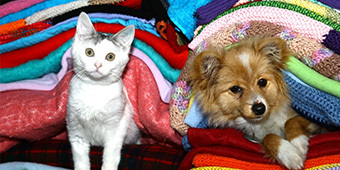 Make sure to swap them regularly so your pet doesn’t become bored with them. Over time your dog will learn that the room is a safe and enjoyable space and when fireworks or storms happen they may choose to go there because they know when they are in their safe space, no harm will come to them – helping them cope. You should also talk to your vet ahead of firework and storm season about ways you can help manage their anxiety. In some cases they may prescribe medication to help your pet cope. In some cases your vet may find it necessary to trial medications before fireworks and storms so it is helpful to speak with your vet well in advance. What about when fireworks and thunderstorms start? When fireworks and storms happen in your area make sure you stay with your pet, or organise a pet-sitter for the night that is reliable and familiar with your pet. Close any windows and black out a doggy play area so your dog can’t see the flashing lights. It is sometimes helpful to also have music or white noise playing. Ignore the fireworks or storms yourself. Play with a toy to see if your dog wants to join in, but don’t force them to play if they don’t want to. Offer your dog plenty of play activities, food treats and food dispensing toys to give them something fun to do. Like dogs, some cats can get anxious around fireworks and storms. If your cat is scared of these events make sure they have somewhere to hide if they want to. This may be under some furniture, or in a quiet corner. Don’t try and tempt your cat out of their hiding spot as this may cause them to become more stressed. These tips are just a guide, if you need further advice on what you can do to help your pet manage their anxiety during fireworks and thunderstorms chat to your vet. Also remember to check that your details are updated on your pet’s microchip so if they do get afraid during fireworks and run away you can increase your chances of being reunited with your pet. For more tips about caring for your pet this festive season, check out our National Pet ID Month Fireworks, storms and your pet fact sheet.